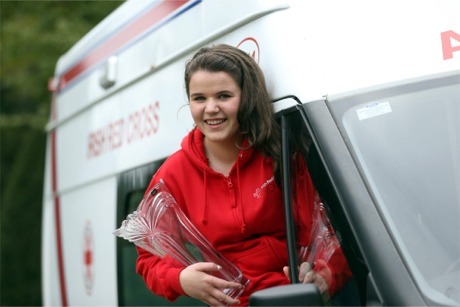 AN Inishowen teenager has been named the first ever Irish Red Cross Young Volunteer of the Year. Sonia McKinney (14) was nominated for the award for her fundraising initiative on behalf of the Donegal Young Carers Group. Normally a very “quiet and shy young girl”, Sonia took everyone by surprise by recording a CD of songs ‘Orla’s Guiding Light’, from the sales of which she has already raised more than €1,000. Sonia, from the border village of Muff, decided to fundraise for the group after the death of her aunt Orla, who had originally set it up. Through her fundraising activities, the local girl is encouraging other young people to discuss their feelings and the importance of opening up "about what makes you sad". Sonia McKinney, Irish Red Cross Young Volunteer of the Year. Sonia received the award at a ceremony last weekend in Farmleigh House, Dublin. The event marked the eve of World Red Cross Red Crescent Day, held each year on May 8 to celebrate the work of the Red Cross globally and locally. Volunteers from twelve counties were shortlisted for the nine award categories. With Cork, Kerry, Dublin, Donegal, Tipperary and Waterford taking home the winning trophies. Irish Red Cross chairperson Pat Carey, said, “My spirits are lifted listening to the stories of our nominees and winners. It is a wonderful thing to have an event like this that recognises the value of volunteers, those here, in Ireland and worldwide”. The Irish Red Cross has approximately 4,000 voluteers in Ireland who provide humanitarian services to vulnerable communities around the country.